Broadsides, ephemeral publications printed for a very specific purpose, often offer a glimpse into a specific moment in history that could easily be lost. 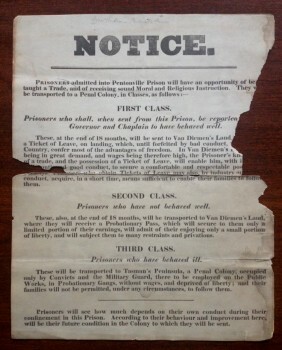 Historical & Special Collections holds hundreds of broadsides, including the rather battered notice to prisoners in London’s Pentonville Prison shown here. Notice to Pentonville Prisoners. London, 1842-1862? HOLLIS 9095766. The notice lays out the three possible outcomes prisoners faced, all of which involved transport to a penal colony in Van Diemen’s Land. Van Diemen’s Land—the name Europeans originally gave to Tasmania—served as a penal colony from the early 1800s to 1877. Depending on their behavior in prison prior to transport, prisoners could look forward to a life of near freedom or continued imprisonment and labor in the colony. Map of Australia from “Report from the Select Committee on Transportation…” HOLLIS 3803660. Transportation—that is, the transport of prisoners—to Van Diemen’s Land ended in 1853, though the last penal settlement did not close until 1877. During this time, prisoners in the “first class” were granted a ticket of leave that allowed them to work for themselves on the condition that they did so within a specified area and regularly reported to their local authorities. Detail of map of Australia from “Report from the Select Committee on Transportation…” showing the northern coast of Van Diemen’s Land. HOLLIS 3803660. In addition to this broadside, Historical & Special Collections holds a report by the Select Committee on Transportation, published in 1837. The committee was “appointed to inquire into the System of Transportation, its Efficacy as a Punishment, its Influence on the Moral State of Society in the Penal Colonies, and how far it is susceptible of improvement.” The report claimed to draw no conclusions, but stands as a collection of observations and documents related to prisoners’ transport to penal colonies. A colored fold-out map is included in the report, and the northern end of Van Diemen’s Land can be seen off the southeastern coast of Australia. The report contains minutes of evidence taken before the committee, with witnesses who ranged from judges and lawyers to members of the clergy and military. Among the many appendices is a chart detailing the “Return of Applications made by the Principal Superintendent of Convicts for Tickets of Leave, for the Month ending 30th November 1832.” An excerpt of the chart shown here explains why a prisoner was or was not granted a ticket of leave and includes remarks from the superintendent, extracts from police records, and the lieutenant governor’s decision. In this case, the prisoner’s request was approved. The second report by the Committee on Transportation published the following year has been digitized and is available to users with a Harvard ID. Detail of chart from Report from the Select Committee on Transportation. HOLLIS 3803660. The New South Wales government has undertaken a project to digitize and index Australia’s earliest convict records. A guide to the index can be found here. Closer to home, though, you can find additional material related to the history of penal colonies, prisons, and prisoner transport in Historical & Special Collections. Great Britain. Parliament. House of Commons. Select Committee on Transportation. “Report from the Select Committee on Transportation [its efficacy as a punishment; its influence on the moral state of society in the penal colonies …] together with the minutes of evidence, appendix, and index. Ordered, by the House of Commons, to be printed, 14 July 1837.” London: 1837. HOLLIS #3803660.